This is such a special post for me. When I say special, I mean really special. A gorgeous bridal session at Big Spring Farm Virginia of this beautiful girl inside and out makes my heart swell. You see, I have known Brooke for a couple of years. She too, is an awesome photographer and it has been a joy watching her grow in talent and beauty. Our paths crossed when she was in high school and we were just getting started in our business as well. She reached out to us with questions and with the little knowledge we had at the time began to offer what we had. I am not sure that we actually gave her much in information, but a friendship blossomed and it has been a joy watching this girl bloom into something so beautiful. Brooke married in the mountains of North Carolina this past November. Her wedding was an absolute dream as you can see here from Angie Mcpherson’s Photos. We unfortunately, were not able to make this wedding but I am so glad that I was able to be a tiny part of it by taking Brooke’s bridals. Brooke loves the mountains and the country feel. 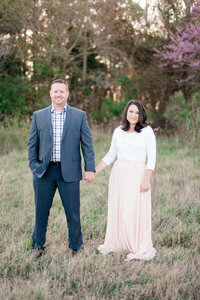 After lots of research and calls, she decided on Big Spring Farm as the location for her bridal session. We hopped in the car on a gorgeous fall day with mom and my three kiddos and we set off on an adventure. I always loved the bond Brooke has with her momma. During the car ride it was such a sweet time to listen to them talk and their anticipation of the wedding. We arrived to this gorgeous venue Big Spring farm in Virginia and it was unreal. The view and serenity it brought was definitely something to take in. I was in awe everywhere I turned of the beauty this place beheld! Then Brooke stepped into her gown and she was stunning! I am loving all the dresses lately that have these beautiful sleeves. It is such a timeless look and Brooke looked absolutely timeless. Paired with her cathedral veil she really looked amazing! Being apart of moments like these is what I live for. Watching her mom take in this moment as her daughter steps into a new chapter of her life was something that will always be with me. It is an honor to tell their stories for not only them but generations to come. Brooke, you are an amazing young woman inside and out. I am truly excited for this new chapter in your life with your best friend. I wish you nothing but a lifetime of love happiness! To see some awesome weddings visit below! It looks so beautiful and happy!